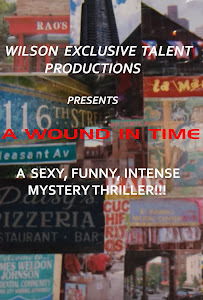 A WOUND IN TIME: MOVING RIGHT ALONG!!!!! I've been busy editing the script by changing some of the dialogue to visuals. It is a very tricky thing to do with a mystery thriller as you don't want to edit out the clues, and intrigue that lead you to the surprising outcome. With the precision of a surgeon, I hope to have edits completed in a few days. I am very excited to begin scouting for locations after the New Year with the Cinematographer. Being that I have decided to use the more expensive film instead of digital, we will be looking for places that provide the textures and character that only film can do justice to. Also because there are flashbacks, and scenes with a supernatural ambiance, it is important to create the feel of the scene. Filming of interior shots should begin in late February or early March. I already have the budget, shot list, and breakdown for "Day One"... Between now and then we all will be working hard to raise the funds for the estimated remaining 8-9 days of filming. ...The beginnings of creating, not just a film... but Art. DIGITAL OR FILM? THAT IS THE QUESTION! I WANNA MAKE ART! NOT A FILM!